This entry was posted on 01.02.10 at 6:05 pm and is filed under Uncategorized. You can follow any responses to this entry through the RSS 2.0 feed. You can leave a response, or trackback from your own site. This artwork reminds me of a couple of pieces I viewed at MFA Houston recently. Each was a photograph of a young, upper middle class child and their toys. First, a Japanese girl and all of her pink toys, and second, a boy from the US with all of his blue toys. 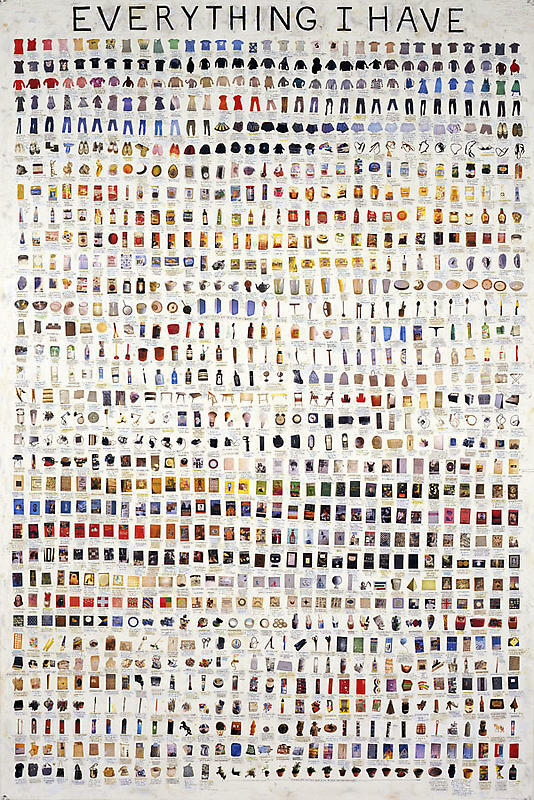 Startling to see how our gender identities and values are shaped by our belongings. Also, in the State of the Earth 2010 issue of National Geographic, there’s a spread showcasing 2 families and their belongings – one from the West African nation of Mali and the other from Japan. Mali citizens spend an average of US $1.69 a day on food and other household products while a Japanese individual spends about $42.03 per day. An annual average of $616 and $15,342 respectively.